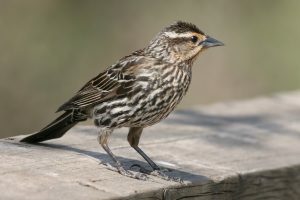 The Red-winged Blackbird is native to North America. Being one of the most abundantly found birds of the country, their count was estimated at 190 million in the mid-1970s, and has significantly increased in the present decade. Till date, the population of these birds is stable. Though there are frequent instances of these birds being aggressive with humans, they play an important role in the ecosystem and food chain by controlling pest population. Size: Both male and female adults are approximately 22 cm in length with a wingspan of 30 to 37 cm. Weight: Both the sexes weigh between 41.6 and 70.5 grams. 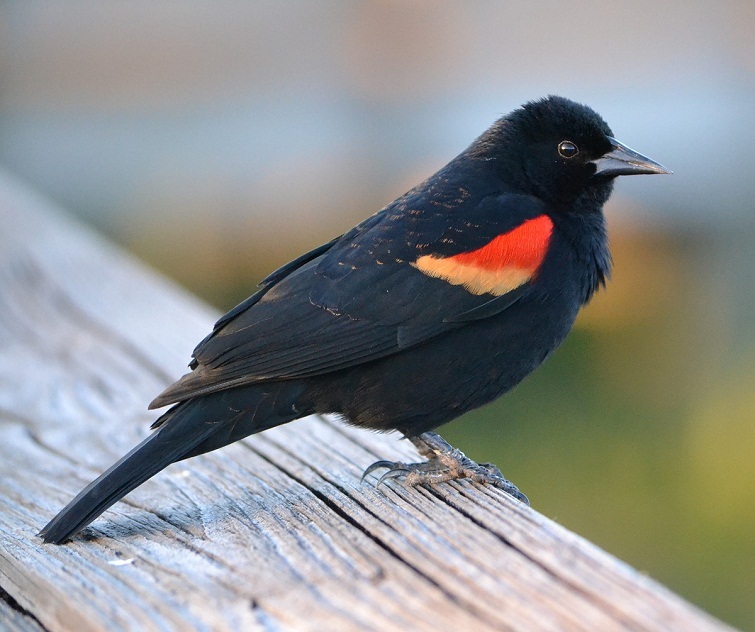 Plumage/Feathers: The male red-winged blackbirds are completely black, and the females are dull to dark brown. 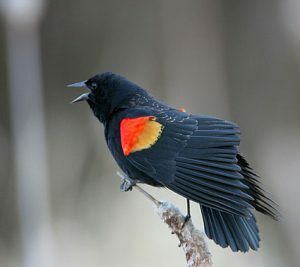 Adult males have distinctive red to orange shoulder patches, or ‘epaulets’, with a yellow wing bar, which can be seen when they fly, or display. This is a very clear sexual dimorphism in this species. Tail: The tails are black in males, and dull to brown in females, both measuring to 6.1–10.9 cm. Bills/Beaks: The bills are medium-sized, pointed, and hard. Eyes: The eyes are round shaped and are black all over. In the wild, red-winged blackbirds live 2.14 years, on average. 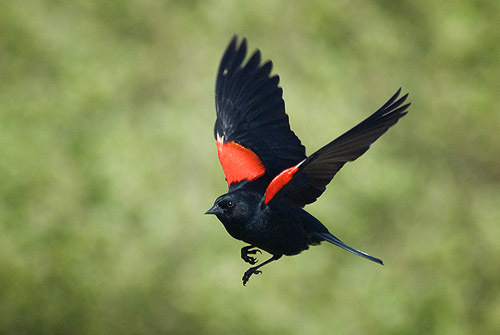 The oldest recorded longevity of the red-winged blackbird in the wild is 15 years and 9 months. Red-winged Blackbirds are spread from the east of Alaska across Canada to Newfoundland and the southern regions of north Baja California, the Gulf Coast, Florida, and central Mexico. 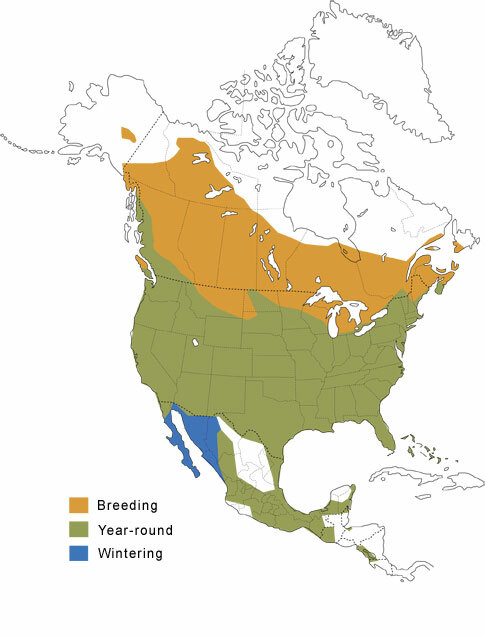 They spend the winter months across the northern parts of USA to British Columbia, Pennsylvania, and the Great Lakes. 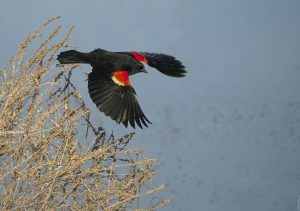 The preferred habitats of the red-winged blackbirds include sedge meadows, alfalfa fields, fresh and the saltwater marshes, and other types of croplands. These birds would also flock around manmade birdhouses, and bird feeders. 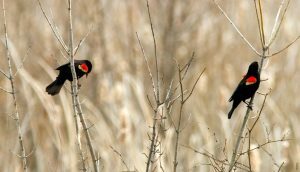 Known for their aggressive and attacking tendencies, the red-winged blackbirds form flocks outside of their mating season, often associated with other blackbirds and starlings, and nest close together in groups. These birds pack tightly into small areas and are extremely territorial, mostly during the breeding season. In winter, they share their roosts with other species of blackbirds including European Starlings, Brown-headed Cowbirds, and Common Grackles. 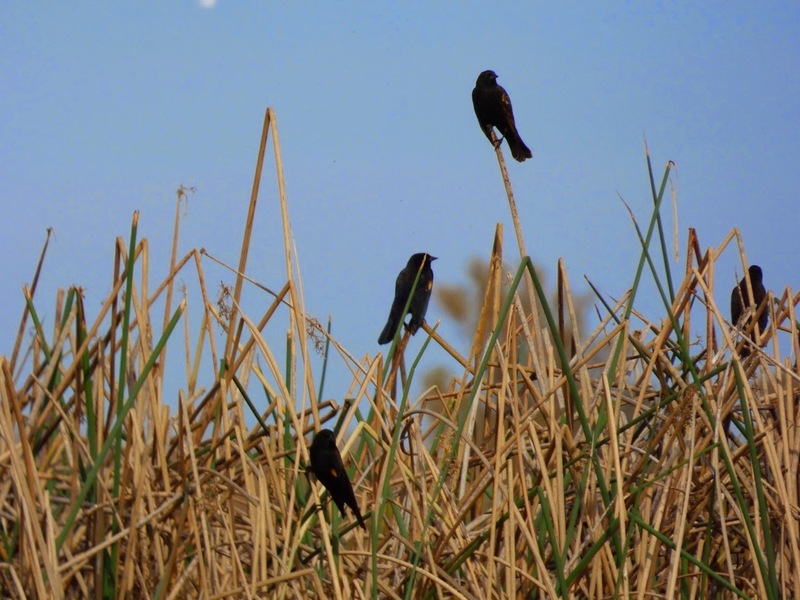 The male red-winged blackbirds would often sit atop tall cattail plants to keep an eye on their territories. Once they spot an intruder, they wouldn’t take a moment’s time flying and attacking boldly displaying their red wing-patches. These birds usually forage close to the ground level, however, they also search for food hopping on shrubs and trees. Forages mostly while walking on ground; also sometimes up in shrubs and trees. Red-winged blackbirds communicate both vocally and visually. In the eastern region of the USA, the male birds would utter their common song of “oak-a-lee” or “konkeree” in the spring. Pre-mating calls are a set of noises that sound like “ti-ti-ti,” which may be uttered by both the sexes. 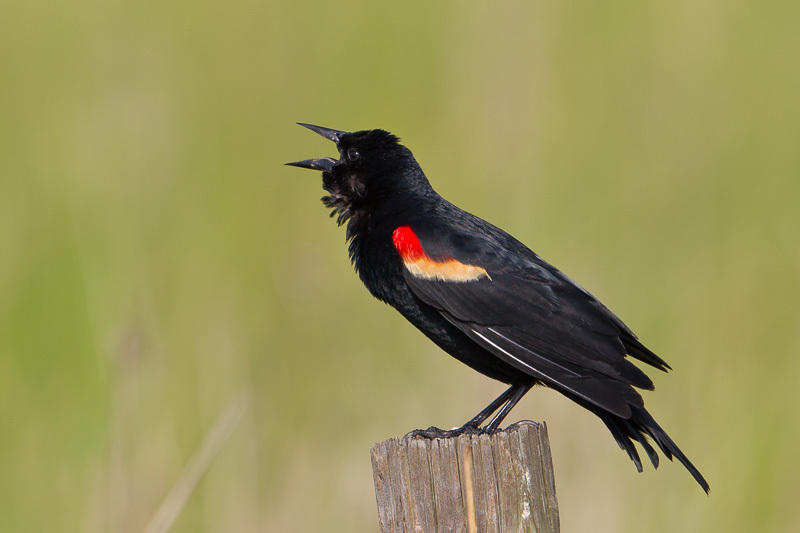 You can listen to the mp3 Red-winged Blackbirds’ calls here. 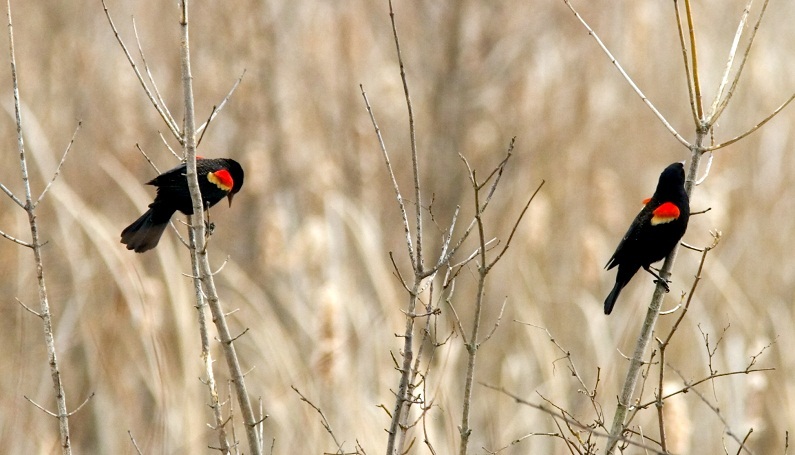 The red-winged blackbirds would migrate between their winter feeding areas and summer breeding grounds. During the winter months, as a sign of migration, they would gather in huge groups, and stay in or close to such areas where they have lavish access to seeds and grains. Aggressive behavior is one of the primary characteristics. Flocked in groups, these birds will drive away predators much larger in size, by ganging up on them, and even attacking humans and causing nuisance. However, they are not vicious. They would only attack if anyone would accidentally enter into their territories, wandering or jogging. During attack, they would typically swoop down and grab the body with their feet, and would continue repeating the action every one to two minutes, until they drive the human out of their territory. They will continue to attack until you are away from their territory. These birds feed upon insects and seeds. Their diet list comprises of a wide range of insects including grasshoppers, beetles, spiders, snails, millipedes, caterpillars, etc. Roughly three-fourths of the diet of the adults’ annual diet is seeds, which includes waste grain, grasses, weeds, etc. They would indulge in hunting insects mostly in the summer months, while during winter, they often depend on small fruits and berries. 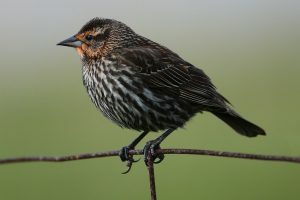 Red winged blackbirds are one of the most polygynous of all bird species, with the males usually mating with 2 to 4 females, which might even count up to 15. The breeding season of these birds continues through the early spring until mid-summer. It is during this time that their aggressive behavior shows up more intensely, attacking even approaching larger birds, and loudly protesting against human intruders. 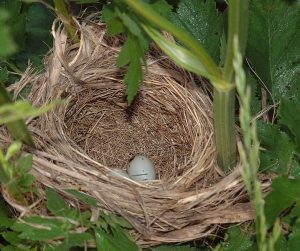 The nesting season is between March and May. As a mating ritual, the male would fluff its epaulettes to show off the red to the full extent. 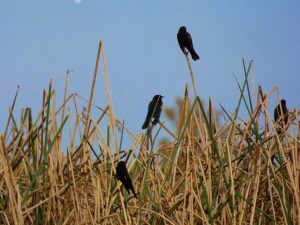 After a successful mating, building the nests atop marshland vegetations such as bulrushes, cattails, etc. is a part of their nesting habits. Their homes are usually built by the female. 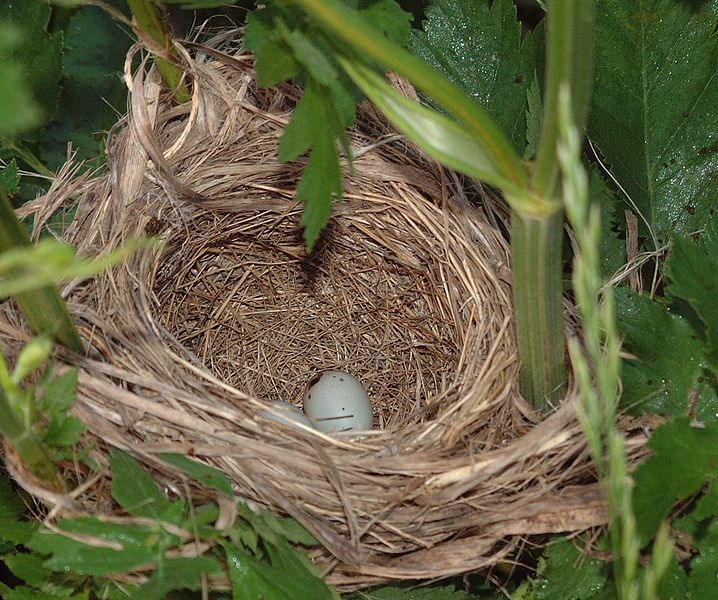 The nest shapes like an open cup, made of leaves, rootlets, reeds, grass, and is lined with fine grass. The female red-winged blackbirds can raise up to three broods in a single season; however, the average is 1.7 broods per season. The number of eggs hatched can be anything between 2 and 6, but generally 3 to 4. 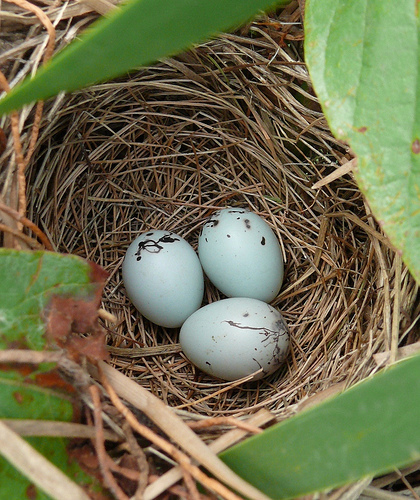 The color of the eggs is pale blue-green, marked with purple, black, brown spots at the broader end. The incubation period is 10-12 days, and is primarily done by the female. After the eggs are hatched, the young birds are born blind and helpless, depending solely on care from the parents. Both the father and the mother gather food and feed the immature birds. It takes around 11-14 days for the hatchlings to leave their nest. The juvenile birds need to be fed for up to three more weeks from the time they learn to fly for the first time. Female RWBs are brownish to drab in coloration which makes them difficult to be spotted when they are in their nests. Red-winged blackbirds often tend to build their nests at a height of one to two meters above water in order to save their eggs and fledglings from predation. These birds are preyed upon by a diverse set of enemies that include snakes, foxes, raptors, skunks, raccoons, weasels, and larger birds of prey. 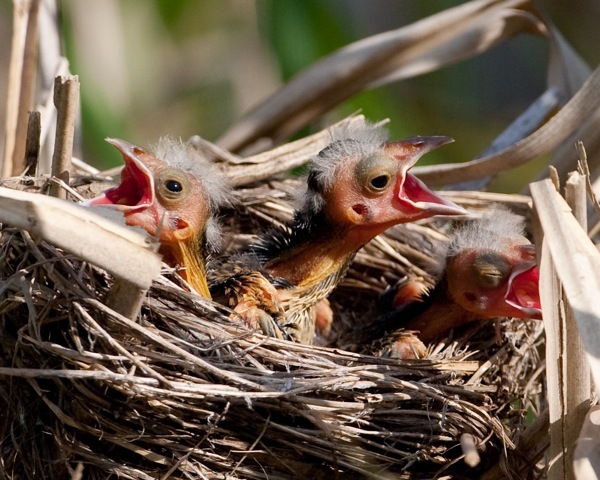 Most predation occurs on the nestlings and the eggs. In their territory, these birds would often declare war against the Marsh Wren, with both species consuming and destroying each other’s eggs. The red winged blackbird is not a threatened species. The IUCN 3.1 has categorized it under the ‘LC’ (Least Concern) species list. A group of blackbirds is collectively called a “cloud”, “cluster”, and “merl” of blackbirds. Incidences of attack mostly take place between March and May, their nesting season. In loose flocks, this species can be found in an excess of a million individuals per flock, while in peak years, the number of breeding pairs across Northern and Central America may exceed 250 million. Local belief says, if a red-winged blackbird comes flitting across someone’s path, it is a symbolism of good luck meaning a forthcoming big change in life. The control and repellent measures used to reduce damage to rice, corn, and sunflower crops have now been a major reason for deaths of adult Red-winged Blackbirds. On an average, the territory of a male red-winged bird is 2,000 square meters. 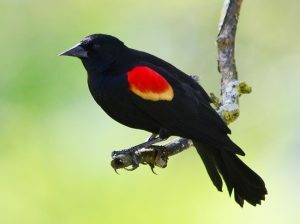 It is believed that, if you have a red-winged blackbird totem, you would have a spiritual awareness of all changes of perception as they start to show up inside you. These birds have a long history and connection with the indigenous tribes. Legend says that, a Native American hit the bird on the wings, making it bleed, and thus turn red. 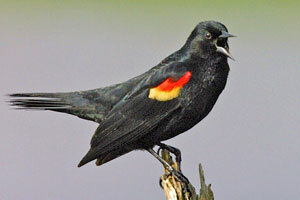 The red-winged blackbirds are protected by the Migratory Bird Treaty Act. If someone purposefully harms an individual, he can be charged penalty of up to $250,000, and might even face a jail time. 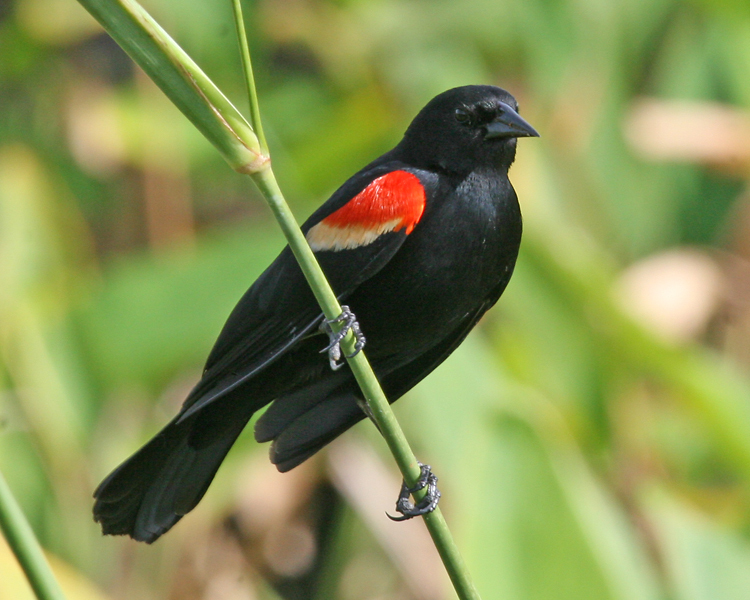 The red-winged blackbird ranks among the best-studied wild bird species in the world. lots of info that I love to know, love your effort. info that I love to know at school.